Hobart is the picturesque capital of Tasmania. Sitting at the base of Mount Wellington, Hobart is a hub for arts and culture, and offers guests the opportunity to explore local galleries and authentic street art, consume local produce at the many acclaimed restaurants, and enjoy views of the harbour and mountains. As one of Australia’s oldest capital cities, Hobart also has a rich history that has been thoughtfully preserved for visitors to discover and enjoy. Visitors to Hobart enjoy the many outdoor activities on offer in the region, including climbing Mount Wellington, visiting the Royal Tasmanian Botanical Gardens and kayaking in the local waterways. The multitude of historical and cultural museums on offer in the area allow visitors to learn about the area’s convict and maritime history, while the local distilleries, breweries and wineries provide interesting places for locals and tourists to explore and sample beers, gins and wines. Hobart experiences mildly warm summers and cold winters. Visitors looking to explore the outdoors or camp generally travel during the spring and summer months, while others travel in winter and enjoy the open fires found in many pubs and restaurants. Domestic visitors from Brisbane, Sydney or Melbourne can travel directly to Hobart Airport, while those visiting from overseas or other states can catch a connecting flight from one of these destinations. Central Hobart is only 20 minutes from the airport, and visitors can reach their accommodation via shuttle, or by using taxi services or car rental. 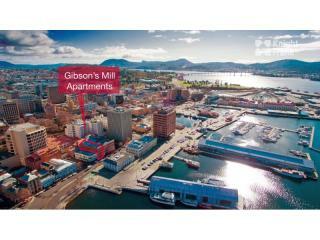 Hobart is home to approximately 220,950 people, but welcomes many more each year for business and leisure. Tourism has grown in Tasmania by 30 percent since 2012, with 1.2 million visitors travelling to the state last year, and many of these staying in Hobart for all or part of their stay. To cater for these visitors, Hobart has a total of 824 accommodation options and food services, which employ 7.1 percent of the local population. There are plenty of both budget and luxury accommodation options, with hotels, motels, serviced apartments, hostels and holiday parks on offer. With Tasmania’s goal of welcoming 1.5 million visitors to state in 2020, Hobart is expected to see continued development, allowing even more people to see and experience all it has to offer.